Manchester United can forget about singing Thomas Müller. The Times says the talented German “put an end to Manchester United’s hopes” by signing a new deal with Bayern Munich until 2021. The Times calls this a “snub” to Old Trafford. The news also makes you wonder what the Daily Mirror was talking about when it declared in August: “Thomas Muller wants to join Manchester United”. What role did Eva Carneiro, the former Chelsea club doctor who left her post in controversial circumstances, play in Jose Mourinho’s downfall. In a word: none. The Spiky One was was sacked because Chelsea were losing matches and flirting with relegation. But the tabloids turn Dr Eva v Jose into a front-page debate. 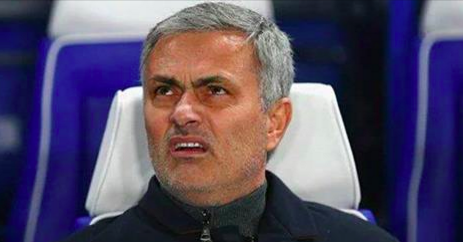 Jose Mourinho has been sacked as Chelsea manager. But how much did he have stuffed inside his pockets as he sauntered off? In other words: they have no idea. Now that Jose Mourinho has been sacked by Chelsea (again), Harry Redknapp can tell everyone he felt it coming. Jose Mourinho isn’t special any more. He can’t have any complaints if he is sacked. Football. It’s all about consistency. Farewell, then, Jose Mourinho, sacked at Chelsea for the second time. You were the self-styled Special One. You were then ‘The Happy One’. Now you are ‘Taxi For One’. The Daily Mail never saw it coming. 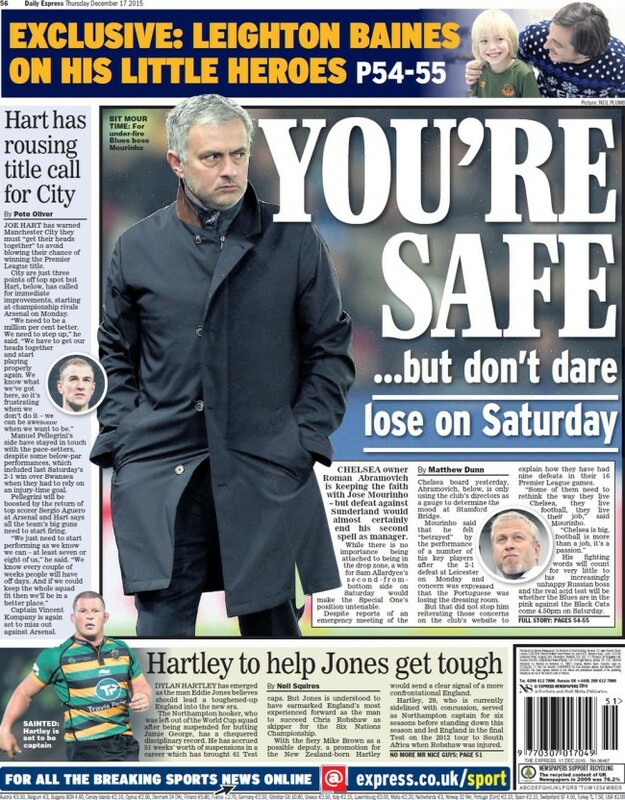 Its back page today stated that Jose was “safe”. Pep Guardiola has moved “one step closer” to Manchester City says the Mirror. 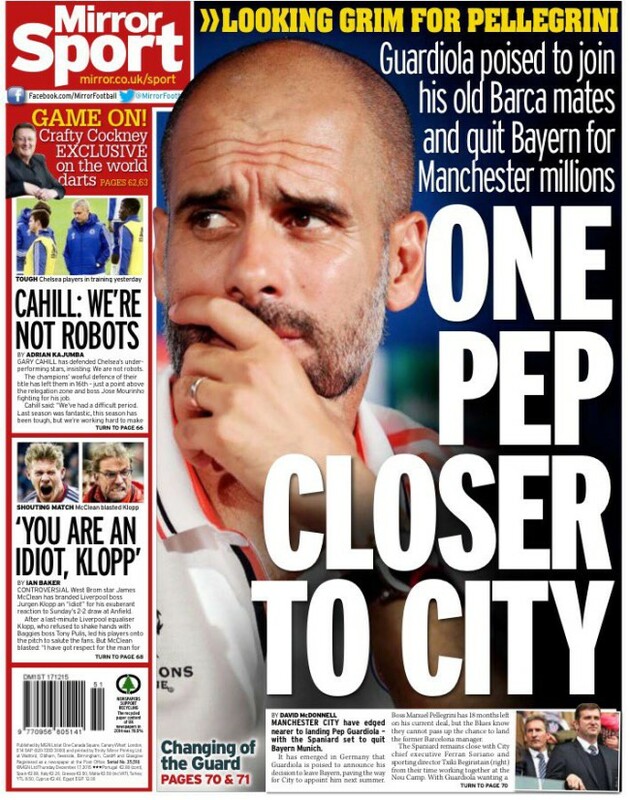 The paper leads with news that Pep Guardiola is “poised to join his old Barcelona mates and quit Bayern Munich for Manchester millions”. It seems odd that a man at the top of football would be in it for the money, as the Mirror implies. Does he really want to live in Manchester? Would he not prefer to wait for a London club, say, Arsenal, where his style of football would be an easy fit? The Sun says Arsenal would suit Pep, but they have less money to spend on top players and Arsene Wenger is not leaving. As for the wages, Marca says Bayern have offered Pep £14.5m (€20m) a season. He’s not exactly shy of big-money offers. So why City? Well, he has worked with The Citizens’ chief executive, Ferran Soriano, and the director of football, Txiki Begiristain. Those are his “Barcelona mates”. So much for the headlines. But reading on in the Mirror we learn that Pep is not poised to join City. He has simply announced that he will make his decision on whether or not to remain at Bayern Munich in the next week. However German magazine Kicker does say he is definitely on his way out. Guardiola is in the final year of his contract with Germany’s champions. What he’s going to do next is largely a matter of media guesswork. The Guardian says “his availability next season would also appeal to Manchester United and possibly Chelsea”. The Times says Chelsea is not an option because Pep was “unsettled by Roman Abramovich’s relentless pursuit while he was enjoying time away from the game in New York”. The Sun returns to the Pep pay packet, saying Chelsea will pay him the most. They want him to “name his price”. City will offer him £84m over four years. Chelsea will top that and throw in a glitzy life in London. Pep has options. That much is clear. But the Mirror says he’s on his way to City for sure. In fact, he’s already “lined up stars” to play for him at the Etihad, players like Paul Pogba and John Stones. What would it cost Chelsea to sack Jose Mourinho? The newspapes know. 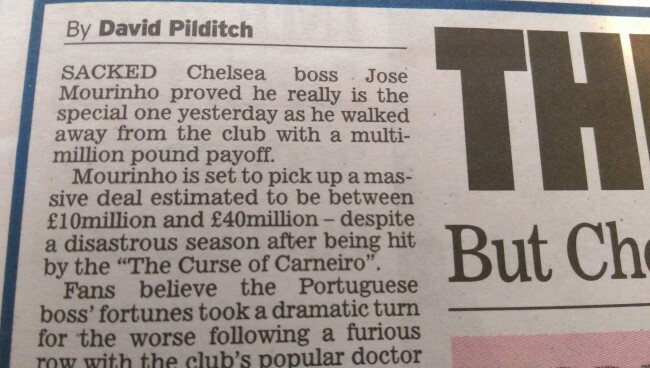 The Daily Mail says “Roman Abramovich will be forced to pay Jose Mourinho more than £40million“. 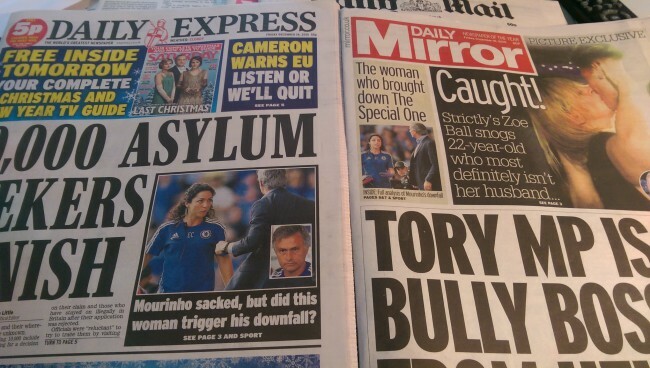 The Mirror says sacking Mourinho “could cost £40m“. The Express says it would cost a “staggering £37.5m“. The Telegraph says “Jose Mourinho due £10m compensation if he is sacked”. 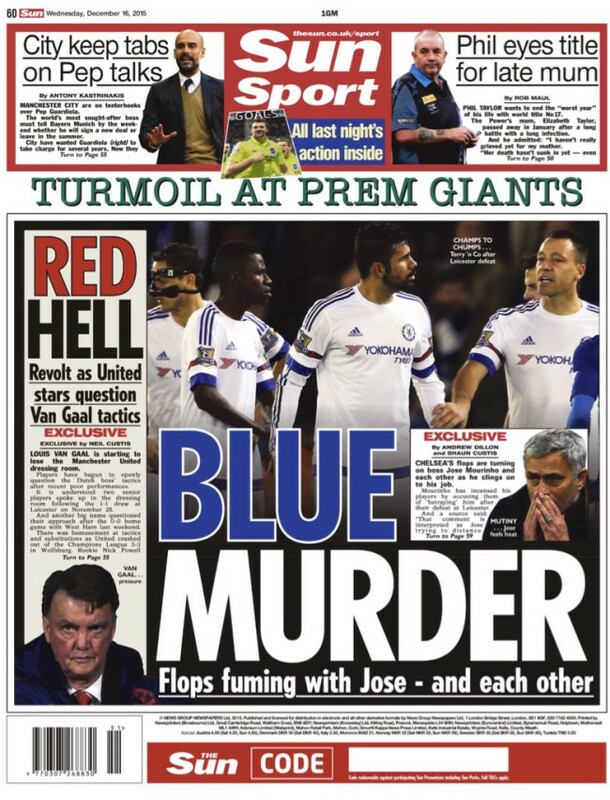 In today’s tabloid football round-up, we look first at the Sun, which leads with news of “Revolt” at Manchester United and “Blue Murder” at Chelsea. “Chelsea’s flops are turning on boss Jose Mourinho,” write Andrew Dillon and Shaun Curtis. A “source” tells us that Jose is being “SLAYED IN CHELSEA”. We’re then asked to wonder if Jose is morphing into Rafa Benitez, a man not all that popular at Stamford Bridge. But unlike Rafa, Jose’s job is safe because there are no “viable alternatives”. 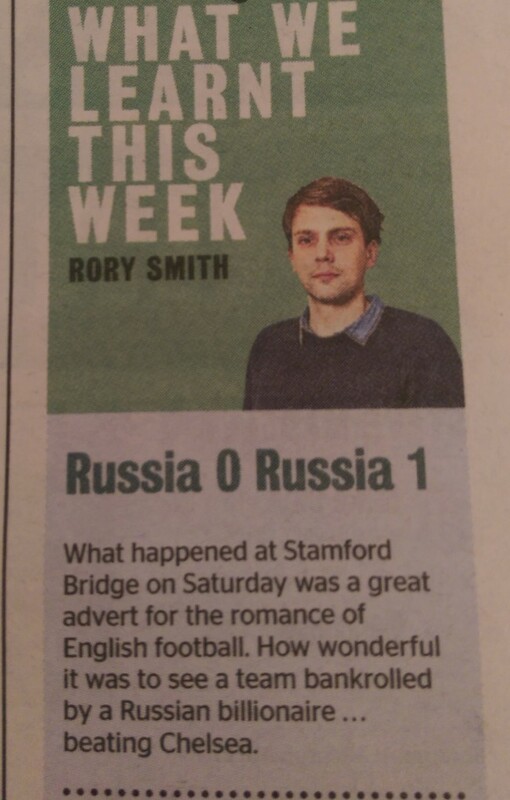 In “no fight club”, Chelsea fan Rory Jennings says the team are “soft”. He evokes players like Ron Harris, Dennis Wise and John Terry to emphasise just how tough Chelsea used to be. He omits to mention that before Roman Abramovich’s billions, Chelsea were losers who sold cars by the side of the pitch and pulled in smallish gates as one of the Second Division’s larger clubs. Chelsea fans moaning about their “crisis” is laughable. But, then, for most current Chelsea fans their support began when dad took them to a padded seat at the Bridge on their way to the rugger. After three pages of what’s wrong with Chelsea, football fans get one page of what’s right with Leicester City, who sit top of the Premier League after victory over Jose’s overpaid dullards. News is that Riyad Mahrez and Jamie Vardy will not be sold in January. Good. Of course, should a huge offer come in for one or either, Leicester might be tempted. Returning to the Sun’s Manchester United’s scoop, the story is that some players at Old Trafford have found reason to think Louis Van Gaal’s tactics are a bit plodding. Which they are. A few players have told him where he’s going wrong. The odds on the hammer headed Dutchman listening to their advise is thinner than Jose’s smile. The Star leads with more Chelsea news. 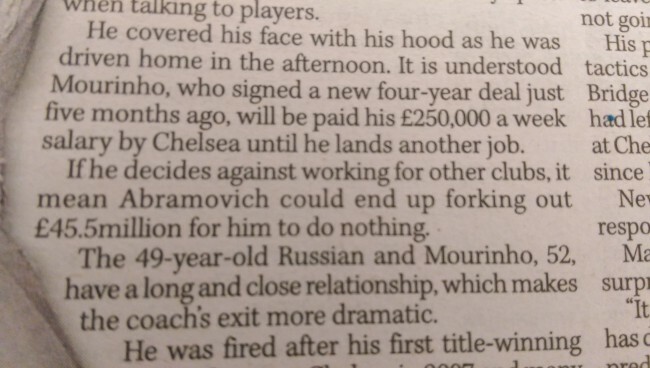 Readers learn that Roman Abramovich will “NOT sanction a Chelsea spending spree next month”. This is the same Roman who made Chelsea what they are today with a £1bn interest-free loan. One page on and we lean that the Blues have £40m for Everton’s John Stones. The Blues buy players. It’s what they do. The Express’s lead story is that Stones is gong nowhere. Yet. 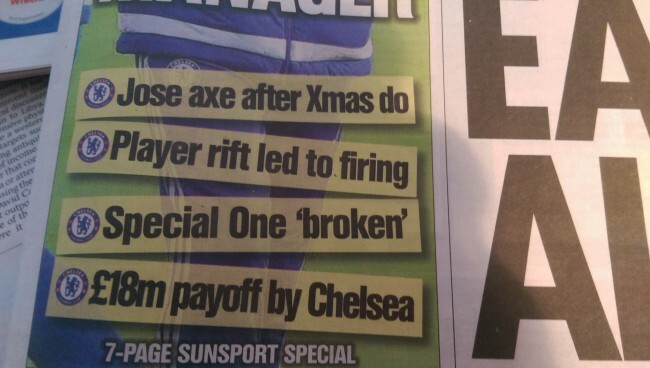 The Mirror leads with news of players leaving Chelsea. The back page has Jose telling Eden Hazard “I should have sold you in the summer”. He’s right. One year ago, Hazards was being talked about as one of the game’s greats. This season he’s a busted flush, trying but lacking inspiration and zip. 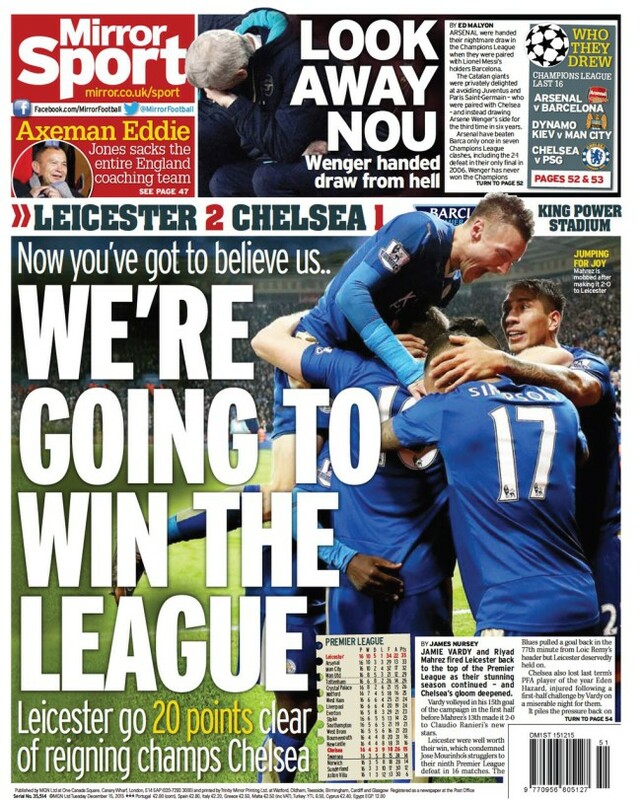 Over two pages, the Mirror looks at Leicester city. It invites seven of the game’s names to answer the question: “Will Leicester in the Premier League?” All of them say…’no’. So much for the glory game. BuzzSport report, United bosses are concerned they will fall short in their pursuits of the likes of Lionel Messi, Neymar, Cristiano Ronaldo or Paul Pogba. 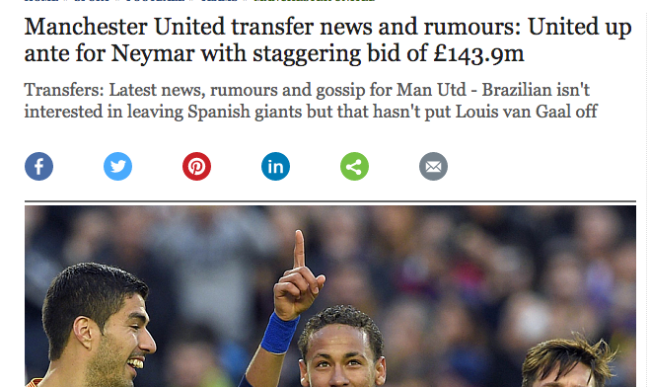 Unable to sign any of those players, United will – get this – swoop for Luis Suarez. …they are looking into the possibility of a move for Suarez, hoping he could be tempted by a return to the Premier League. Reports from Spanish press Don Balon claim that the La Liga giants want the Gunners’ star duo Alexis Sanchez and Mesut Ozil. Facts to support the Spanish magazine’s claim: zero. Simon Mignolet is set to be handed a new deal by Liverpool boss Jurgen Klopp despite his latest blunder. Liverpool fans must be overjoyed. 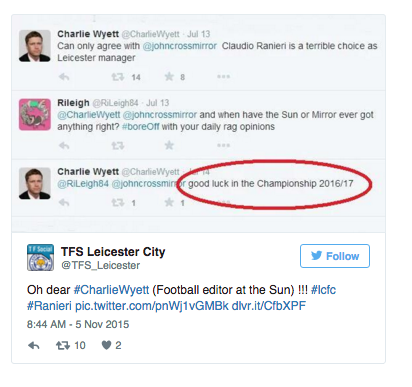 A few words from The Sun’s Charlie Wyett, who has noticed that Claudio Ranieri’s Leicester City are top of the Premier League. Can they win the thing? Ranieri continues to build something special in a different part of England. It is proving to be one of the truly great Premier League stories. Former Chelsea player David Luiz is worried about going bald. He’s been researching how it can be prevented. Short of dying young with his ringlets still inserted in his scalp, he could do as as other have done and walk about Los Angeles with a hat on for some months, enjoying the city where the likes of fellow beanie hat wearers Brad Pitt and David Beckham hang out. It is an established fact that anyone wearing a beanie hat in the LA sunshine is prevented from every going bald. See also: being in The Rolling Stones. I know I look crazy but I am not! It is just hair… Yes, my father is bald. But I found a way to save my hair. I met with a doctor in Brazil, who has developed a special treatment. It takes some cells from here (your hip) and then relocates then. I will do it. In ten years it will be the solution for people who have lost their hair. You should try it! Nice of David to offer everyone cells form his hop, but best to wait until his playing days are open lest he become lopsided and take to running around in circles like the current Chelsea defence. The Daily Express says this January Chelsea will return with a £40m bid for Everton’s John Stones. This is, of course, a complete guess, based on the Chelsea’s failed moves for Stones over the summer. The Blues failed with £40m in the summer, and a combination of their bad form and Everton’s consistency and optimism will will surely only necessitate and much higher bid. A few days ago. the Independent said Manchester United will offer £50m for Stones. Simon Jones ups the ante, telling Daily Mail readers that Barcelona are also after the English defender. There were noises linking Stones to Barcelona before, but the Catalans instead bought Jeremy Mathieu from Valencia for £14.5m and Thomas Vermaelen from Arsenal for £15m. Right now Stones is earning £30,000 a week at Everton. If he’s worth £50m, then surely his wages will have match the £200,000-a-week Manchester City pay their £50m striker Raheem Sterling. That surely leaves Arsenal out of the running – and Everton unable to hold onto their star. Rumours abound that Arsenal are making moves for Everton’s John Stones. The Sunday People adds a layer to the story by claiming Everton manager Roberto Martinez is keen on replacing Stones with Arsenal defender Calum Chambers. Chambers has featured in less than half of the fixtures the Gunners have played this season, with Hector Bellerin keeping him out at right-back and Per Mertesacker, Laurent Koscielny and Gabriel Paulista all ahead of him in the centre. Chambers as a right back was something Arsenal were forced into last season when injuries bit. He was less than brilliant, getting skinned alive by Swansea’s Jefferson Montero as Arsenal lost to Swansea City. Ultimately, the Arsenal manager sees Calum Chambers more as a holding midfielder. For now, he is making a remarkably mature fist of being a centre-back. Chambers has the potential to be a terrific and versatile player. Stones is the player all the top clubs covert. 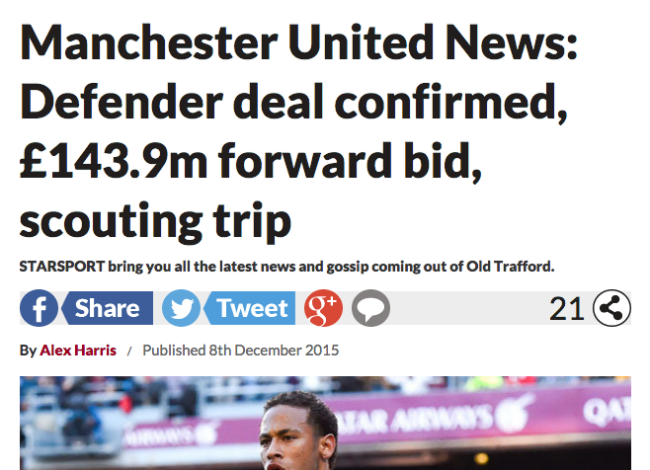 The Metro says Manchester United are readying a £50m offer for him. Would Arsenal compete with that? And Wenger’s not in the habit of selling young English talent. 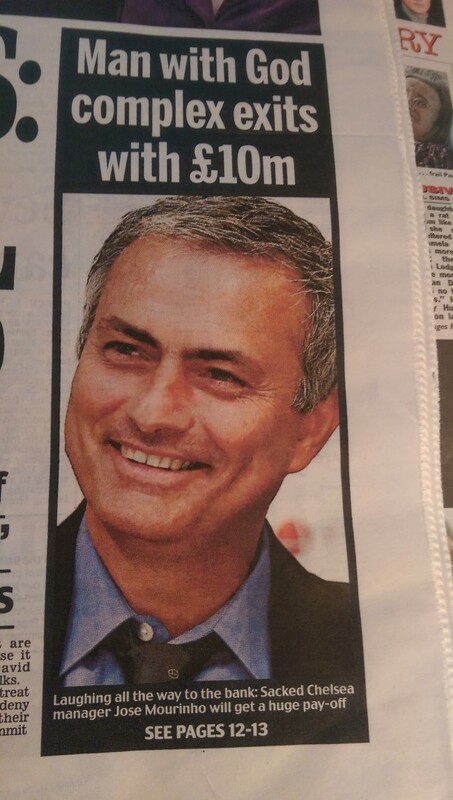 In an “exclusive” the Sun says Real Madrid want to re-sign current Chelsea manager Jose Mourinho. The Real players and fans might not like Mourinho, but the Sun says the club’s president, Florentino Perez, is a big fan. A source says the pair share a relationship that “goes way beyond the professional”. As your heads spin with images of the pair taking long walks in the rain and sharing rooms on away days, readers soon learn that no approach has been made to Mourinho. The story is based entirely on that unnamed source. Cynics might wonder if this is more PR puffery than actual news. Number of words from Jose or Perez: nil. The Mirror says Arsenal have made Southampton’s Victor Wanyama their “winter window priority”. The Kenyan is Arsenal’s “Number 1 target” this January. No mention of Wanyama, there. And no mention of him over at the Metro, where the Gunners’ main target is said to be Atletico Madrid forward Antoine Griezmann. Jürgen Klopp has told Daniel Sturridge he must start to play through the pain barrier to address the problems that have blighted the Liverpool striker’s career. 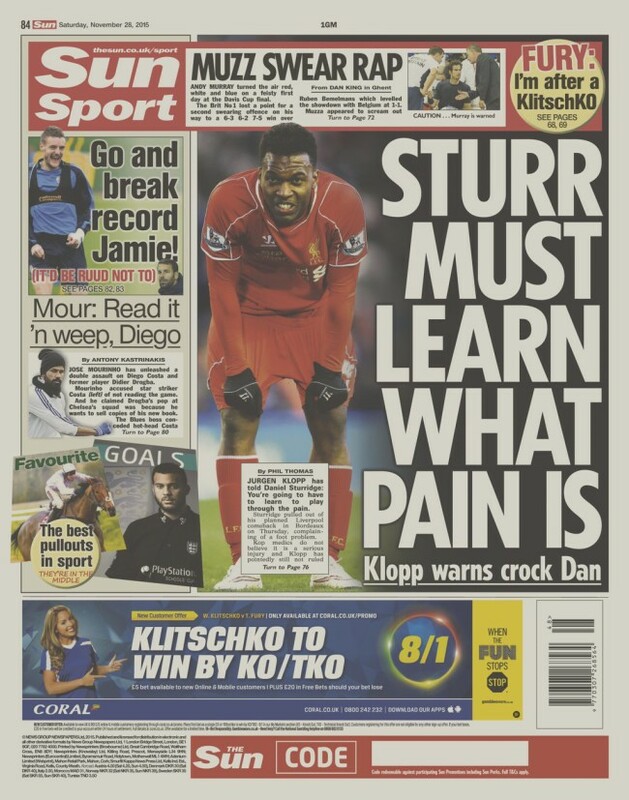 The manager said Sturridge needed to learn “what is serious pain or what is only pain”. 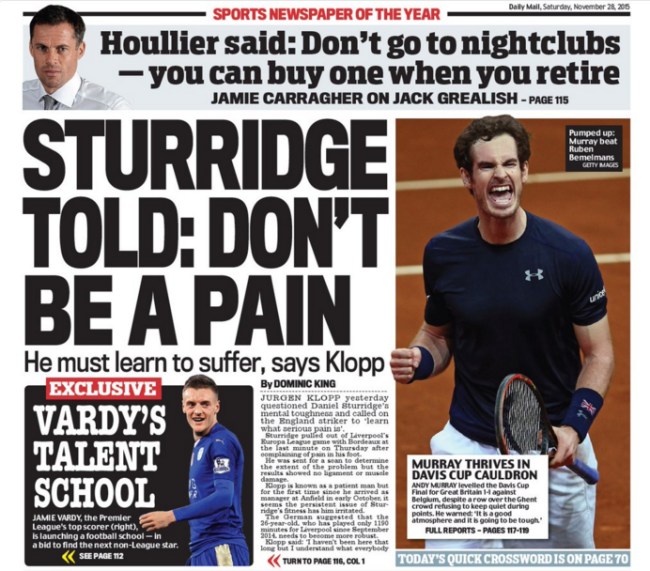 Looks like Sturridge’s pain isn’t all in the mind, after all – and Klopp is fallible. The plaudits are fulsome for Arsenal striker Olivier Giroud, whose hat-trick in Greece secured more Champions’ League football for his club. The Mirror leads with ‘Our Hero’, praising the “much-criticised Frenchman. John Cross praises the “sensational” Frenchman, before cranking up the tabloid-obot: this was a “Greek tragedy” for Olympiakos (you just know he’d have used the same cliche had Arsenal lost); Giroud exhibited “Gallic flair”, as all French players who score must. The Sun calls Giroud a “GREEK GOD”, although which one is unsaid. We’d go for Morpheus, what with his having sent Arsenal into “dreamland”. Charlie Wyett evokes May 1989, when Arsenal had to defeat Liverpool by two clear goals to win the title. I was there – and beating Olympiakos by a similar margin comes nowhere close to that magic night. Olympiakos are an ordinary team playing in a weak Greek top flight; Liverpool ’89 were mighty. Back then Arsenal had Alan Smith up front. Was he better than Giroud? Did ‘Smudger’ play with Continental flair or English grit? Wyett adds that that Arsenal “cannot win the Champions League”. But, of course, they can. You have to be in it to win it, and they are. Odd that having evoked that unlikely night in 1989, Wyett should dismiss the underdog’s chances. In a column called ‘Five Things We Learnt”, the Sun says Giroud will “never be a world-class striker”. Readers are then told that Hector Bellerin has been “Arsenal’s stand-out player for the past 18 months” – which he hasn’t been. The Spaniard has been good, often remarkably so, but to say he’s made more of an impact that Sanchez or Ozil is absurd. And you can add Giroud to that list of top Arsenal players. Who can be blamed for Manchester United crashing out of the Champions League in the group stages? It’s worth noting that this is an improvement on last season, when United failed to even qualify for European football’s biggest tournament. 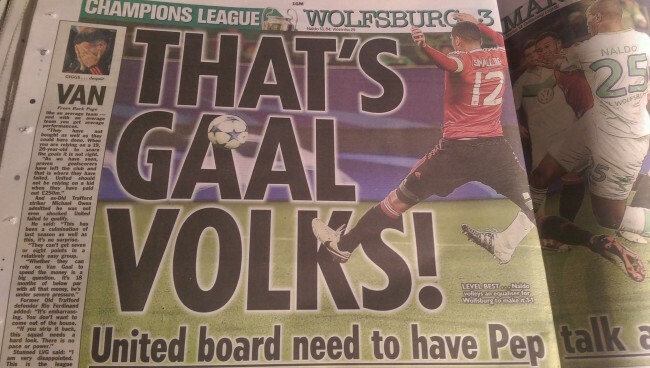 The Mail says the buck starts and stops with United manager Louis Van Gaal, who is “hammered for his abysmal tactics”. Martin Samuel says United lost “because they could not not pick ip an old-fashioned big lad in the penalty area at set-pieces”. As Van Gaal admits to his side going “backwards”, Chris Wheeler says United’s owners, the Glazer family, want to extend his contract beyond 2017. No evidence that they do. But just saying it is enough to start that most wanted to tabloid aims: a heated debate. And so it proved Emission Impossible for Manchester United as their Champions League campaign spluttered to a halt. Wolfsburg may have been rocked by the emissions scandal that has engulfed sponsors Volkswagen, but last night it was the Reds who were left on the hard shoulder of European football. Embarrassing. Manchester United deservedly departed the Champions League because they defended like amateurs, not like elite professionals. They were drawn in an easier group than Manchester City yet find themselves in the Europa League. Welcome to Thursdays. Excruciating. Van Gaal’s reputation was damaged here. For United’s biggest game of the season, he took two eye-catching decisions. Guillermo Varela, the 22-year-old Uruguayan who made his debut against West Ham United on Saturday, started at right back; he made a couple of good tackles, but betrayed his inexperience by getting dragged into the centre, gifting André Schürrle space outside. More controversial was Van Gaal’s decision to field Marouane Fellaini alongside Bastian Schweinsteiger with Michael Carrick kicking his heels on the bench and having to wait until 20 minutes from time for his 70th Champions League appearance. Fellaini lost the ball twice in the opening five minutes and did little to stop Wolfsburg’s counterattacks. 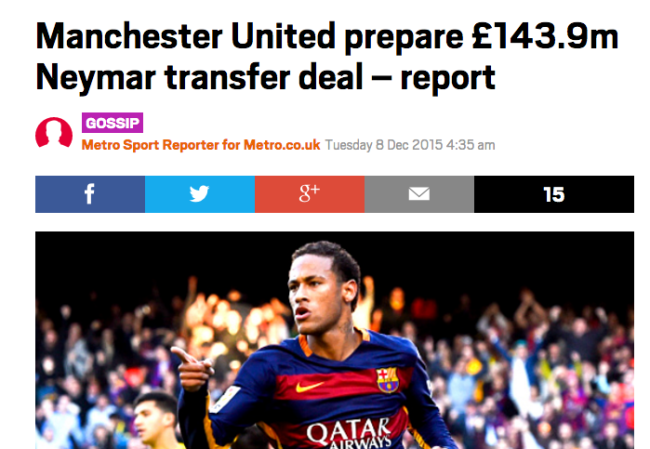 Transfer balls: The Daily Telegraph says Manchester Untied are ready to splurge £143,9m on Neymar. It would be a staggering and eye-watering deal if Manchester United could pull it off but the likelihood of Neymar joining Old Trafford remains extremely slim. Even though the Barcelona forward insists he’s happy at the Nou Camp and doesn’t see his future anywhere else, that does not seem to stop reports surfacing that United will up the ante in an attempt to persuade the seemingly unpersuadable. Is “reports surfacing” code for ‘reports being made-up’? Today reports are doing the rounds that United are preparing a quite preposterous £143.9 million offer to sign the Brazilian next month. …But for all the money United appear willing to splash out in an attempt to land Neymar, the player is not for budging. Barca, however, may be willing to sell – in order to balance the books. The Tele doesn’t bother to link to the source of its story. The Star says the story emerges from Old Trafford. The Metro says the story is rooted in Spain. Cristiano Ronaldo and Gareth Bale have been linked, but Fichajes says United are preparing a £143.9m move for Neymar. Over there, we’re told nothing of that nutzoid fee being quoted across the UK Press. But we do learn that United have €200m so invest and “the Brazilian international will not hear talk of the Red Devils…. Neymar currently wants to establish itself as the absolute star of the Spanish league and follow in the footsteps of Lionel Messi as Barca”. Farewell, Gary Monk, manager of Swansea City, soon to be the Swans’ ex-manager. The papers all agree that the affable young Englishman is to be replaced by former Liverpool manager Brendan Rodgers. The Daily Express says Rodgers return to Swansea is a sure thing. The Guardian says Monk, 36, will be given his P45 when Swansea chairman Huw Jenkins returns from collecting his OBE in London. But let’s not shed a tear for Monk. The Sun says he’s in line for a£3m payoff to Monk., That’s not too shabby. The Sun shows Ancelotti looking huge and vibrant, massive, hulking presence over Louis Van Gaal, the current Man United manager, who appears tiny, looking down and rubbing his nose. The Sun suggests Man United. Ancelotti to Arsenal would be perfect. Why have the wheels not already been set in motion? !’ – Daily Mail, March 2015. 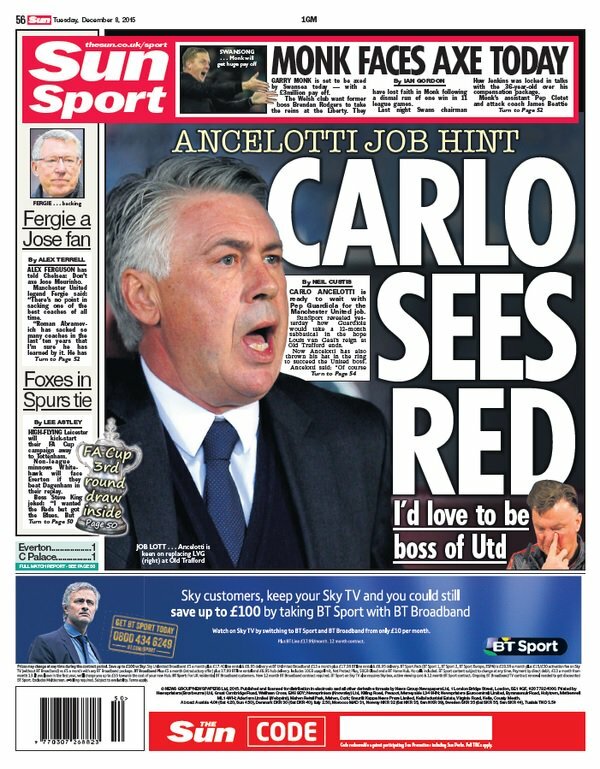 ‘Liverpool make contact with Carlo Ancelotti as pressure mounts on Brendan Rodgers’ – Daily Mail, September 2015. ‘Chelsea plan for Jose Mourinho exit with Carlo Ancelotti waiting in the wings’ – Daily Mail, October 2015. ‘Carlo Ancelotti has now set his sights on his next coaching role. He wants the Bayern Munich job if Pep Guardiola decides to leave’ – Daily Mail, December 2015. That would be the Alex Ferguson who for seven years refused to speak to the BBC after they dissed his son. Yesterday Bournemouth beat Chelsea 0-1 at Stamford Bridge. It was cracking result for the south coast club playing for the first time in the Premier League. Martin Skrtel’s own-goal for Liverpool in their 2-0 defeat 1t Newcastle takes the player’s tally of shots-in-the-wrong-goal to 7, leaving him level with fellow Red Jamie Carragaher in the most top-division own goals table. Skrtel is now only three hits behind the Premier League’s leading own-goal getter, Richard Dunne, who scored 10 times between 1997 and 2015. Gary Neville, aka Gary the Red, self-styled Robert De Niro look-alike, and the former Manchester United and England defender, has taken a management job at Valencia. The tabloids all lead with the news. The Mirror calls him “One EL of a boss”. He will “REIGN in Spain”. 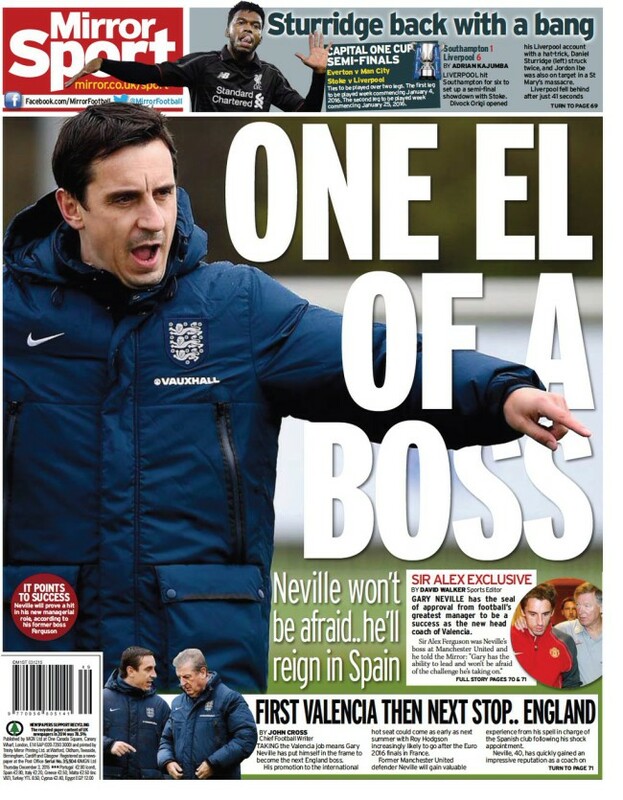 The paper’s David Kidd says the “temptation is the regard Gary Neville’s appointment at Valencia as merely an audition for the England or Manchester United job”. Well, consider that temptation accepted. 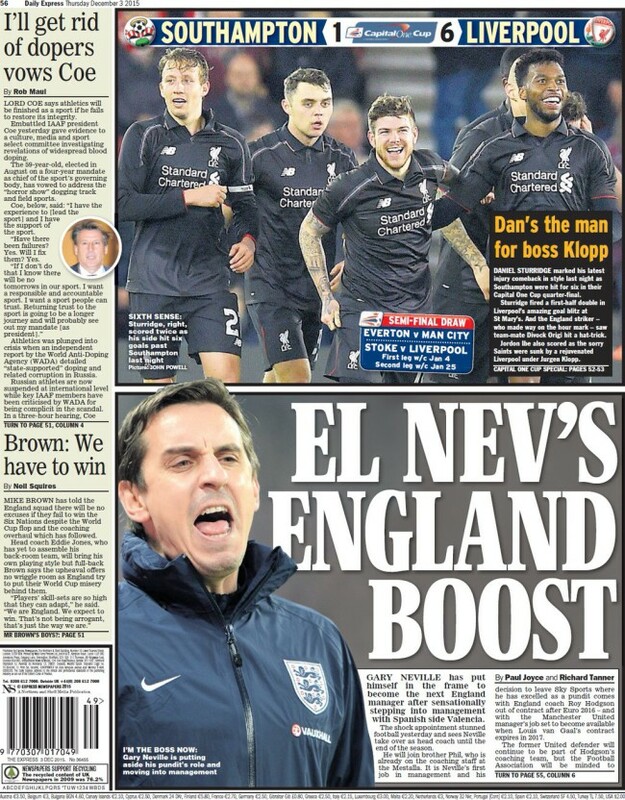 The Mail says England could be next to Neville. And the Sun says The Valencia role is “audition for the Three Lions job”.